I'm pretty in love with this tea cake because it's sooo pretty to look at AND it's delicious! Best of both worlds. ;) I am a huge huge fan of using fresh herbs with fresh fruit because life's too short to stay in your swim lane. With citruses all the craze right now at farmer's markets, this is a serious need to bake teacake and wonderful for breakfast or for afternoon coffee/tea. I mean, how beautiful are these blood oranges?! I'm in serious heaven!! My favorite part about this recipe is during the first part of candying the oranges where your kitchen will smell like this amazing citrus sweet symphony. Then, you add in the rosemary and POW. You actually end up with this incredible syrup that can be used to flavor cocktails or sparkling water mocktails. :D This is the gift that keeps giving! Note: Do not slice your oranges too thin or else they'll just boil down to nothing. Also, minimize your stirring when the peel is simmering in your sugar water. The more you stir, the less pulp you'll have on that rind. You want to keep as much of this in tact as possible for that pretty lining on your cake. There are a few parts to this cake but don't let that scare you off. Keep calm and bake on. Also, feel free to add other citrus cousins to this cake if you are so inclined to! I've added kumquats and it pairs wonderfully. Couple of notes on your ingredients: Go with organic oranges. I REALLY think this makes all the difference. The sweeter and better the fruit, the BETTER THE CAKE! Same goes with the olive oil used in this cake. I LOVE my California Olive Oil so suggest you use your favorite olive oil for these yummy cakes. Happy baking! 1. Start by making the candied fruit. In a medium saucepan on medium high heat, add water and sugar together. Lightly stir together until sugar melts. Bring to a simmer. 2. Add in sliced oranges layering on top of each other. You want the oranges to just barely sit at the same level as the water after adding into the pot. Lower heat to simmer and keep oranges there for 17-20 minutes until tender. Remember to stir every now and then but be VERY gentle as to not break the peels. They will become more fragile as they cook. 3. Remove orange slices and place on a cooling rack to dry. 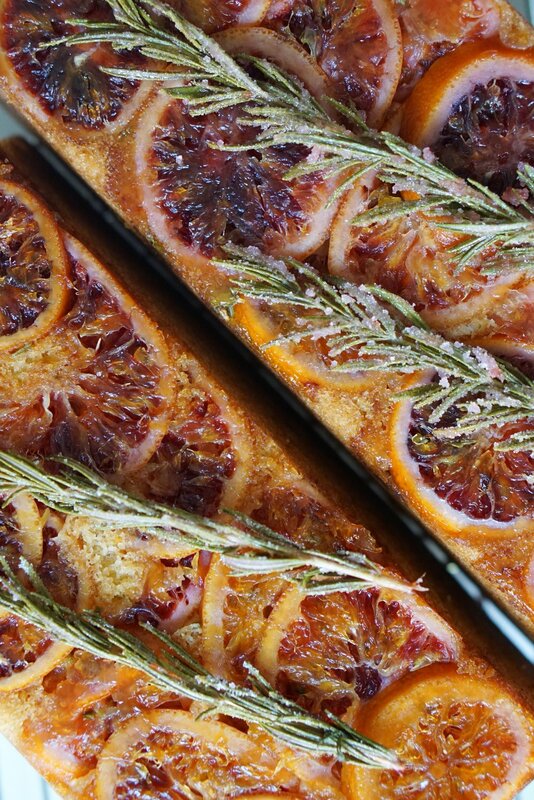 Use the remaining orange sugar water and add rosemary sprigs. Simmer for another 5-7 minutes. Add a little water if needed and toss the rosemary so it's covered in the sugar water. Remove rosemary and place on the cooling rack. 5. Preheat oven to 350 F. Generously butter a 9x5 bread loaf. 6. Layer cooled candied orange slices on the bottom of the pan layer on top so they are an even layer covering the bottom of the pan. Take chopped rosemary and sprinkle on top of the orange peel in the pan. 7. Start the cake batter by making the almond paste. Add almond flour, sifted powdered sugar and the large egg together in a small mixing bowl. Stir until well incorporated into a paste, set aside. 8. Next, work on the rest of the cake batter. In a medium bowl, add your dry ingredients, flour, baking powder, baking soda, salt and orange zest. Whisk to incorporate together and set aside. 9. In a stand mixer bowl with a whisk attachment, add almond paste, canola oil, olive oil, and sugar. Careful, the oil may splash during mixing! Whisk together on slow at first then increase speed to medium until all the ingredients are incorporated. One egg at a time, add and beat without adding the next until the egg has been incorporated. Batter will start to get thick and creamy then add milk and orange juice. 10. Pour prepared batter into the orange and rosemary lined bread pan. Spread with a spatula so it's even in the pan. Give the pan a light tapping on your countertop just to get rid of any air bubbles but do not tap too many times because of your oranges on the bottom. Place into heated oven and bake for 45mins-1hr until deep brown. Rotate the pan once 70% of the way through baking. Do not remove from the oven unless a toothpick comes out clean! 11. Let it cool in the pan for 20minutes. Invert on a cooling rack and let it cool completely. At this point you can brush the cake with the remaining orange/rosemary syrup or leave as is. 12. Slice and enjoy!! Keep in an airtight container or plastic wrap for 4-5 days.